Monday, August 12, 2013 -- 6:00 P.M.
All persons desiring to speak during public comment or item specific comment will be limited to three (3) minutes per person. Additional information regarding any items listed on today’s agenda can be obtained from the Health Commission Secretary at the Public Health Department located at 2191 Johnson Ave, San Luis Obispo. All times shown in the margin adjacent to the numbered items are estimated and are not to be considered a time guarantee. 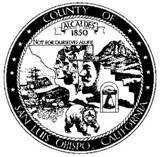 The County Health Commission’s monthly agenda and minutes can be accessed at the following website: www.slocounty.ca.gov/health. Para personas quienes necesiten un interprete (en espanol) para hacer una presentacion a la comision, por favor llame al Telefono 781-5520, antes del miercoles 14 de noviembre. Se hara todo lo possible para proveer este servicio en las ocasiones que sea solicitado.